His Holiness Baselius Marthoma Didymus I has entered eternal rest at 7.35 pm on May 26th 2014. He loved and cared for me so much. When H. H. Baselius Marthoma Mathews II bava thirumeni decided to resign, called H.H.and said that it was H.H. turn to take the throne of St. Thomas, H.H. in turn at 11 in the night called me up and said, "aboone I need a unique name., there are too many Thomas in the sky". I told H.H. "we will find one thirumeni" The name I suggested 'Dydimus' became H.H's official name. H.H. asked me to assist H.H. in Angamali diocese which I did for eight months. One day H.H. made a surprise visit to my place at Mannuthy. I asked, "What is the matter thirumeni, a surprise visit?" H.H. replied "my failure is that I have an innocent heart in this world of follies" quoting a poem in Malayalam (ee kapada lokathil aathmardhamayoru hrudaym undayathanu en parajayam). His Holiness was too disturbed by the atmosphere people created there. His Holiness was a true monk and an innocent shepherd. These are my personal experiences. I would certainly miss H.H. I request H.H. 's intercession on my behalf who is left in this world of follies. Holy father, a good shepherd, a true monk and loving father (Selun baslomo Qumro Rabo M'aliyo) GO NOW IN PEACE and pray for all of us. Dear Thirumeni, may his soul rest in peace on the bosom of our lord. This is a loss for me too. His prayerful life & sweet chanting of qurbano attracted me a lot. He is my spiritual rabbi. When I was 15 yrs old, his qurbano changed my life. I was blessed by seeing him on my birthday unexpectedly at Be Be chappel Nellippally on 2013. May the Soul of H.H didymus valiya bava tirumeni of blessed memory go in peace and may his intercession be a stronghold to us. Tirumeni i had a doubt, Why is that in our tradition, bishops/hig priests are emtombed in sitting position and not buried in coffins. If you could sight any references to it from the bible, would be helpful for me and my friends. There are several cultures around the world that bury their deceased in sitting posture. This is particularly true in some tribal cultures (including some in Tamil Nadu in India). Those cultures consider their deceased ones as still in position they held during their life time. Sitting is the mark of being in authority. This is primarily a cultural thing. In Syriac tradition of the Orthodox Church an episcopo is an episcopo for life. He does not, normally, retire at any point in life. He continues to be one even after death. He still shepherds the community he has been during his life time in this world. So he is buried with all the symbols of his authority as a shepherd. He is seated on the throne, he holds the staff of the shepherd in his left hand and in his right hand he will have the handheld cross for blessing the flock. Going by the direction of the canon, if at all an episcopo retires, he has to go back to a monastery and live like a monk in which case he will be buried in lying position. We do not follow this canon rule in the case of retired primates. After kissing your Grace's blessed and sanctified hand, May I express my heartfelt thanks to your Grace, for exposing your grace's sincere and warm relationship with our noble and pious Shepherd, H.H. 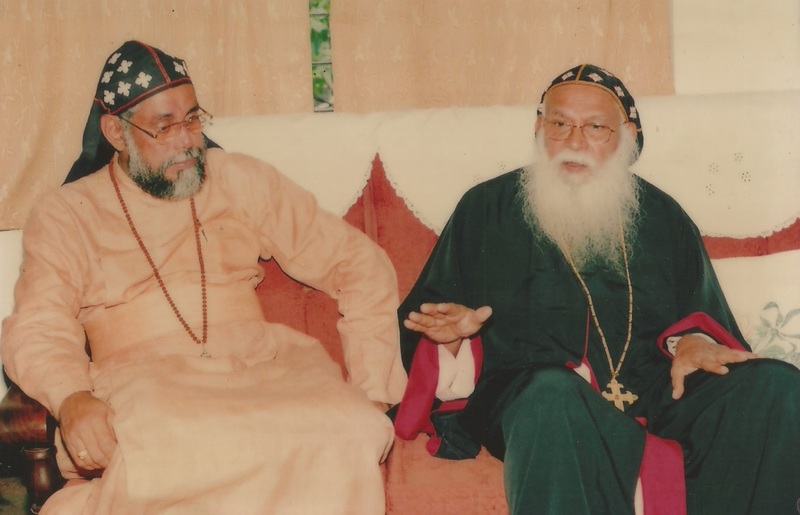 Moran Mar Baselios Marthoma Didimus I, Valiya Bava Thirumeni. I knew no bounds for my personal joy when I heard that Your Grace was the one who suggested this apt name for our Valiya Bava Thirumeni. Let His Holiness do intercede for us all and also for our Church. Your Grace's message as a whole was so touching. Thank you Jose Kurian very much for your comment. Yes His Holiness was my father and we cared and loved each other very much. I miss H H very much.